Japonaise cakes are often mistakenly called Japanese cakes. Surprisingly, the Japonaise Cake did not originate in Japan but is actually a classic French Pastry, also known as Almond Meringue Torte. These small wonderful cakes are made of almond meringue discs sandwiched together with a rich coffee-flavored butter cream. 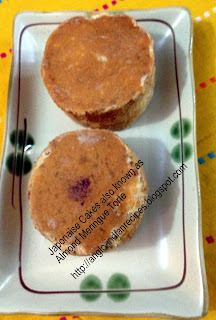 Nilgiris, Sweet Chariot, All Saints, Fatima’s and Thom’s Bakeries in Bangalore made the best Japonaise cakes and we loved them as children. 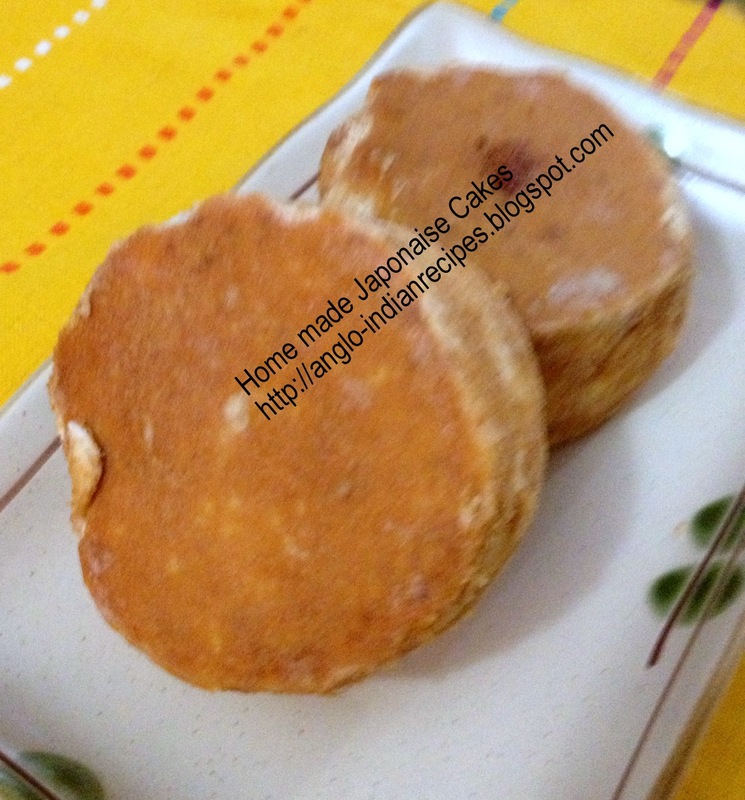 Japonaise cakes are very easy to prepare. If made a day in advance they should be refrigerated until just before serving. This is an easy recipe for small Home made Japonaise Cakes. Mix the powdered sugar, ground almonds, milk and corn flour together in a bowl. Beat the egg whites till stiff with a pinch of salt. Then add 150 grams sugar and continue beating till they form soft peaks. Gradually fold in the almond mixture to get a fairly thick meringue like batter. Grease and flour 3 baking trays. Draw circles measuring 2 inches in diameter leaving some space between each circle. Using a tablespoon, spread the batter in each circle so as to make about 20 small pancakes on the baking trays. Bake each try for 25 minutes or until the meringue discs are crisp and a pale golden colour. Allow to cool completely. Beat the egg yolks, butter, instant coffee and sugar together till creamy. Leave in the refrigerator to cool until it reaches spreading consistency. Spread about 2 tablespoon coffee butter cream on 10 of the meringue discs, then gently cover with the remaining discs taking care not to flatten the butter cream. Dust well with powdered sugar and almond flakes on top and on the sides of each torte. Keep in the fridge until 10 to 15 minutes before serving. Wow! I finally found it. One of my childhood fav dish and I was frustrated not finding its recipe anywhere in the net. Heaven knows how I landed on your page and am so glad I did. Finally learnt its original name and that its not the actual "Japanese" cake as I have known it always. Thanks. Sorry that was left out. Mix the powdered sugar, ground almonds, milk and corn flour together in a bowl. My mum loved this growing up...thought I would try to make them for her....could you please tell me the oven temperature you use?